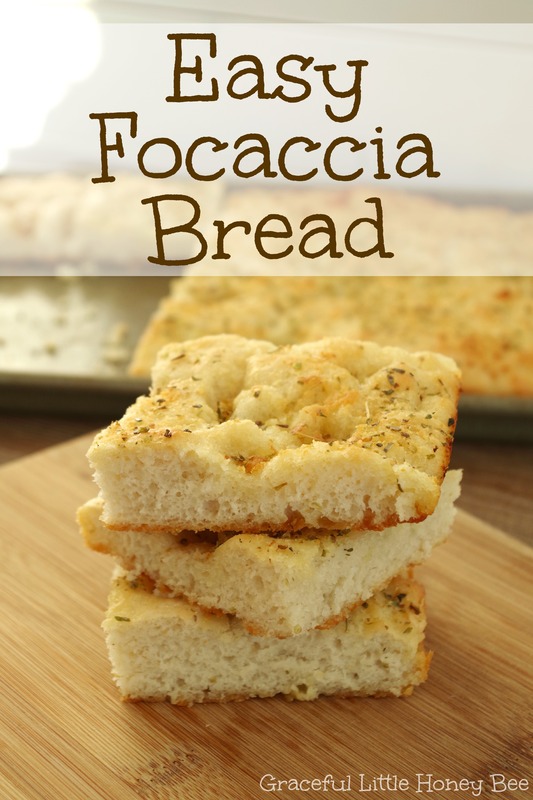 Focaccia bread is an Italian flat bread similar to pizza dough, except it’s thicker and normally topped with cheese and herbs. It sounds complicated and exotic, but I promise you that it’s easier to make than regular bread. This is the perfect recipe for someone who is just getting into making yeast breads because it’s so, so easy. Plus, it tastes AMAZING!! Think homemade Pizza Hut Breadsticks, only better and that’s how this tastes. It pairs great with soups or you can dip it in olive oil and eat it by itself. Once you try this amazing bread you will be in love. I promise. Step 1: Dissolve yeast into water. Step 2: Add sugar and salt. Step 3: Add flour and mix until dough is formed. Step 4: Spray baking sheet and press dough into pan using wet fingers. Step 6: Let rise in warm place for 45 minutes. Step 7: Bake at 400 for 20-25 minutes. Step 8: Cut into squares and serve hot. Add flour and mix until dough is formed. Spray baking sheet and press dough into pan using wet fingers. Let rise in warm place for 45 minutes. Oh, this looks delicious - thanks for the recipe! Looks yummy. I'll give this a try. Thanks for sharing. Hey Missy, I saw this at the link party and had to come check it out! 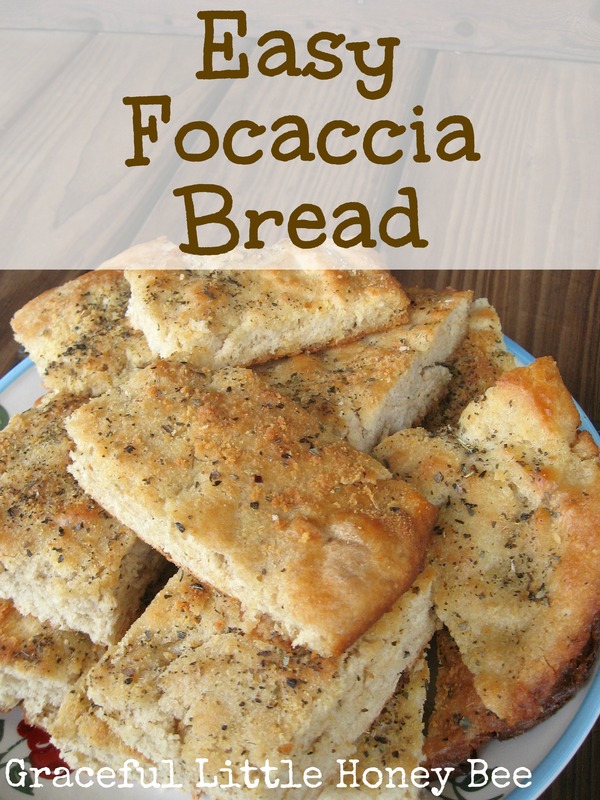 I LOVE focaccia and the fact that it's an easy recipe? YES!!! Thanks for sharing. Can't wait to try it! Erin, Thanks for stopping by and I hope you enjoy the recipe! It really is good! Made this today and it was fantastic, and so easy. Everyone loved it! Thanks for a great recipe. Thanks for sharing. I love this recipe as well. This was amazing! My whole family loved it. I'm embarrassed to say I've never had success with any type of bread besides banana (haha) but this was perfect in every way. Thank you! I'm so glad you like it! :) It really is delicious! Hi! The recipe sounds delicious, can't wait to try. Just a question, would it be possible to add black olives to it and if yes, at what stage? Sorry, a newbie here :) Thanks for sharing! I would add them when you add your butter and other seasonings on top. So funny! First batch: my water must have been too hot and the dough did not rise. So I started another batch and decided to throw in the dough, olive oil, herbs from batch one.. I mixed it all together, placed on a prepared cooking sheet it in my microwave oven just to rise undisturned for 45 minutes. Whoa! It rose out of the pan and all over the microwave. I prepared another pan and moved half the dough to the second pan. Lucille Ball! Dough was alive! I added more oo and herbs. Baked it a liilte longer and it was fabulous!!! Thank you. . So I had this pinned on Pinterest for a really long time. Got a notification that someone pinned my pin today. Decided to finally make it! OMG this is dangerous! Took no time at all to make and it tastes soooo good! I will 100% be making this again.